The Tangente represents NOMOS Glashütte's success like no other model. It was one of their first watches and quickly became a bestseller. Its design draws inspiration from Bauhaus, as reflected in its clean and simple lines. The NOMOS Tangente is simple, linear and has won multiple awards. It is also the manufacturer's best-selling and most numerous model. It debuted in 1992 alongside the Tetra, Orion, and Ludwig, two years after the company's foundation. The Tangente is also popular among celebrities, including former President Bill Clinton and ex-James Bond Roger Moore. Its long list of design and watch awards further underscores this NOMOS classic's success. The Tangente is a truly no-frills watch, which is in keeping with the tenets of the Bauhaus movement. Its most distinctive features are its thin tempered hands, small seconds dial at 6 o'clock, and alternating Arabic numerals and indices. Narrow, angular lugs, a flat case, and a thin bezel also define this NOMOS watch. Current Tangente models range from 33 to 41 mm in size, meaning there's something for every wrist size. However, the most classic version is 35 mm in diameter and outfitted with the manual Alpha caliber. Timepieces with sapphire glass case backs offer a view of the movement's tempered screws, NOMOS perlage, and Glashütte ribbing and sunburst pattern. The collection's top model is the Tangente Neomatik 41 Update. The in-house caliber DUW 6101 powers this 41-mm wristwatch. This automatic movement is only 3.6 mm thick and features NOMOS' own escapement: the NOMOS Swing System. Developed in-house, this escapement premiered in 2014 and has been a statement of independence to the rest of the watch industry ever since. What's more, the Tangente Neomatik 41 Update also comes with an innovative date display. The so-called "ring date" runs around the outer edge of the dial and uses two red markers to frame the current date. 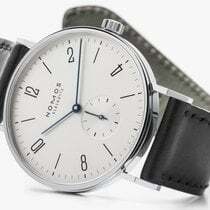 How much does a NOMOS Tangente cost? If you're looking for a typical NOMOS watch, the Tangente is right for you. No other watch is as closely associated with this German manufacturer. The most "authentic" edition bears the reference number 101. This 35-mm wristwatch has a silvery white dial and stainless steel case back. At only 6.2 mm thick, it is extremely flat and makes the perfect dress watch. Mint-condition timepieces are very affordable at around 1,400 USD. You can even find pre-owned examples for under 1,200 USD. The variant with a sapphire glass case back is listed under the reference number 139. It costs about 1,500 USD new and 1,400 USD pre-owned. 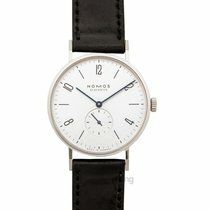 Plan to spend around 1,900 USD for a never-worn NOMOS Tangente with a power reserve display at 1 o'clock. Prices for pre-owned pieces sit around 1,600 USD. Tangente watches with a date and power reserve display demand between 2,100 USD pre-owned and 2,500 USD new. The Tangente 38 is a great choice for anyone looking for a slighly larger watch. This manually-powered timepiece is available with or without a date display. A never-worn model with a stainless steel case back and no date sells for about 1,500 USD. The same model costs around 1,700 USD with a sapphire glass case back. Pre-owned watches change hands for a few hundred dollars less. The Tangente 38 with a date display at 6 o'clock comes exclusively with a sapphire glass case back. Set aside around 1,900 USD for a mint-condition timepiece and 1,700 USD for a pre-owned one. How much do Neomatik Tangente models cost? The Tangente is also available with NOMOS' Neomatik calibers. These movements are especially flat and are outfitted with an automatic rotor. Thanks to its proprietary escapement – the NOMOS Swing System – Neomatik movements are as accurate as Chronometer movements. The manufacturer produces every component of the Swing System themselves, with the exception of the balance spring. It took almost seven years and 12 million euros (approx. 16 million USD) to develop this escapement. The standard edition of the Tangente Neomatik is 35 mm in diameter, only 6.9 mm thick, and lacks a date display. Its movement, the DUW 3001, is only 3.2 mm high and features the NOMOS Swing System. You can recognize this timepiece by its red or orange second hand and, of course, the "Neomatik" inscription on the upper half of the dial. This model comes with a silvery white, champagne-colored, or midnight blue dial. Midnight blue models sell for around 2,600 USD new. Pre-owned examples cost around 2,300 USD. Thanks to its light dial and matching leather strap, the Tangente Neomatik Champagne is a more feminine timepiece. Both it and the white model cost between 2,300 and 2,600 USD. 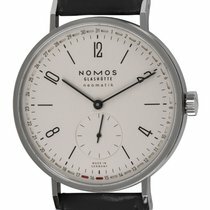 At 39 mm, the NOMOS Tangente Neomatik 39 is the perfect dress watch for larger wrists. Variants with a silvery white or a satin-brushed silvercut dial are especially elegant. On the other hand, the Tangente Neomatik 39 in midnight blue has a sportier look. Plan to spend around 2,700 USD for any of these timepieces in mint condition. Pre-owned pieces are still quite rare. 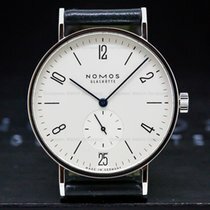 NOMOS presented the Tangente Neomatik 41 Update in 2018. The date display is the highlight of this watch, which measures in at almost 41 mm in diameter and 7.9 mm thick. Unlike most watches, this Tangente shows the current date using two red markers and a scale around the dial edge. You can purchase a never-worn model for some 3,100 USD. NOMOS regularly releases limited edition Tangente models. One example is the Tangente Bauhaus from 2009, of which only 250 copies were ever made. Both the limited edition numbering and the watch's name are engraved into the case back, along with "bauhaus 2009" on the movement's three-quarter plate. In 2009, this manual watch had an official list price of around 1,600 USD. Limited edition NOMOS watches tend to retain their value. In 2018, NOMOS premiered another strictly limited series: the Tangente "A Century of Bauhaus." These timepieces celebrate the 100th anniversary of the Bauhaus movement in 2019. There are nine different versions and only 100 watches will be made of each. The minute scale of every timepiece sits in a blue, yellow, or red ring. All three colors are available in every size: 33, 35, and 38 mm. Their list prices sit at 1,660, 1,800, and 1,930 USD, respectively. How much do women's Tangente models cost? The smallest editions of the Tangente are 33 mm in diameter and aimed mainly toward women. In addition to silvery white, these timepieces are available with a champagne, gray, or karat (golden) dial. Karat models feature gold-plated hands and a brown suede strap. You can purchase this Tangente for around 1,500 USD new and 1,100 USD pre-owned. The standard model has a beige suede strap and is slightly less expensive at about 1,300 USD new and 1,000 USD pre-owned. Founded in January 1990, NOMOS is still a relatively young company. Roland Schwertner , a German IT expert, founded it shortly after the fall of the Berlin Wall, but prior to German reunification. During this time of upheaval, Schwertner visited a relative in the small Saxon town of Glashütte in what was still East Germany. Shortly thereafter, he relocated there to establish his watchmaking company. He picked Glashütte specifically, as it had played an important role in German watchmaking since the 19th century. In the early days of the business, NOMOS didn't even have their own phone. However, it only took a few years before the company was an established and successful part of the watchmaking scene – in large part due to the Tangente's success.